This week was a particularly sad week here in Israel, as a well-known advocate for the State of Israel was stabbed to death by a terrorist. In addition, anti-Messianic Orthodox Jews vandalized a growing congregation in the south of Israel. The war in Syria rages on, as the Syrians accidentally shoot down a Russian ground attack plane. And, the Trump administration continues to take steps against the Palestinian Authority for their refusal to discuss peace. Here is this week’s Middle East update. It is no small thing, in Israel, for Messianic Jews to purchase or build their own building. Wages are low and the cost of real estate is high. Pastor Israel Pochtar is from Ashdod, where Orthodox Jews have been harassing them and their congregation for many years. Not long ago, the 300 members of Beth Hallel (House of Praise) dedicated their new building. Two Ultra Orthodox activists broke though the barrier to vandalize property. One is even brazen enough to take pictures of his friend. They spray painted the same phrase all over the building. Earlier this week, two Orthodox Jews spray painted graffiti all over their facility. They wrote the same words everywhere: Missionaries are a National Danger. Of course, we are not missionaries, but rather Israeli citizens exercising our free right to worship Yeshua and spread His message. They seek to portray us as foreign workers coming here to convertpeople, not as we really are: Jewish Israelis spreading the message of Israel’s Messiah. The police are usually reluctant to investigate such matters, but Pochter has video surveillance evidence of the actual vandalism. As well, a soldier who goes to the congregation caught them in act and chased them off, which was also caught on film. While these attacks can be frustrating (even scary), we must remember that these are the very people we hope to reach. Saul of Tarsus was a violent, anti-Messianic individual – until He met Yeshua. Plus, we are called to rejoice in the midst of persecution (Matt. 5:10-12). Pochtar does not want to press charges, but simply wants the perpetrators to fix the damages. Pray that through this, the message of Yeshua will prosper. American-born immigrant, Ari Fuld was a beloved, outspoken supporter for the right of the Jewish people to have their own country. He was often seen on news programs in spirited debate. He served faithfully in an Israeli Defense Force combat unit and fought in the 2007 Lebanon War. Hear Ari tell how he quit his job in hi tech to serve Israeli soldiers. Fuld was able to shoot the terrorist before being rushed the hospital, where he died. You can read more here and here. The Bible says, “Whoever digs a pit will fall into it; if someone rolls a stone, it will roll back on them.” (Pro. 26:27) Russia has provided Syria with their very sophisticated S-200 Missile Defense System. They never dreamed that the Syrians would turn around and use it against them. But that is exactly what happened last night, when they shot down a Russian military plane. Aboard the plane were 15 Russian soldiers. by their Syrian patrons in northern Syria. The Russians blamed Israel, as the Syrians were targeting Israeli fighter Jets that were seeking to attack a chemical weapons facility. The Israelis allegedly used the Russian aircraft as cover for the attack. It has been widely reported that Syria is planning on using chemical weapons against the lone holdout province of Idlib, near the border with Turkey. Israel is not sitting by while Assad and Putin murder innocent Syrians, even though most of those Syrians hate Israel without cause. Instead, Israel is seeking to neutralize Syria’s ability to use chemical weapons. The Belgium Education Ministry notified the Palestinians that they were cutting ties with them over the naming of a school after a terrorist. Belgium has repeatedly requested that the Palestinians change the name of the school that is currently honoring PLO terrorist Dalal Mughrabi. Dalal Mughrabi was part of a PLO team that carried out a mass terror attack in the 1978 Coastal Road massacre. This is considered one of the more gruesome acts of terrorism, as 13 of the 38 Israeli civilians that were killed were children. What does it say about a culture when they revere and pay homage to someone who murders little children? The school had been funded by the Belgians. Ironically the school named after the murderer of children is an elementary school. 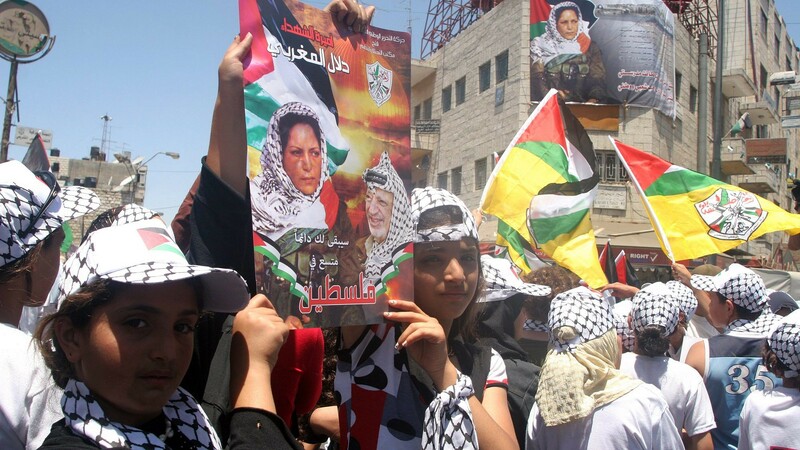 Palestinian children hold of the picture of terrorist Dalal Mughrabi who led a terror team that killed 38 Israelis, including 13 children, in 1978. Good for you, Belgium! Now, see if you can get the rest of Europe to act reasonably when it comes to terrorism. Just before the Jewish New Year, President Trump spoke to American Jewish leaders in a conference call. Recently, the President cut $200 million in aid to the Palestinians. Then he pulled the US out of UNRWA, the UN agency responsible for Palestinian humanitarian aid. The US was giving $365 million in aid, each year. Part of the problem with UNRWA is that they consider any Palestinian Arab who was displaced after War of Independence a refugee—including their descendants. That is five million people! The real number of actual Palestinian refuges is in the tens of thousands, according to a Times of Israel article. In addition, Trump has ordered the PLO to get out of Washington. The crime? The PLO tried to get the International Criminal Court (ICC) to prosecute Israelis for crimes against Palestinians. There is a 2015 US law that states “any action with respect to the ICC that is intended to influence a determination by the ICC to initiate a judicially authorized investigation, or to actively support such an investigation, that subjects Israeli nationals to an investigation for alleged crimes against Palestinians,” will cause the closing of the PLO Washington mission. 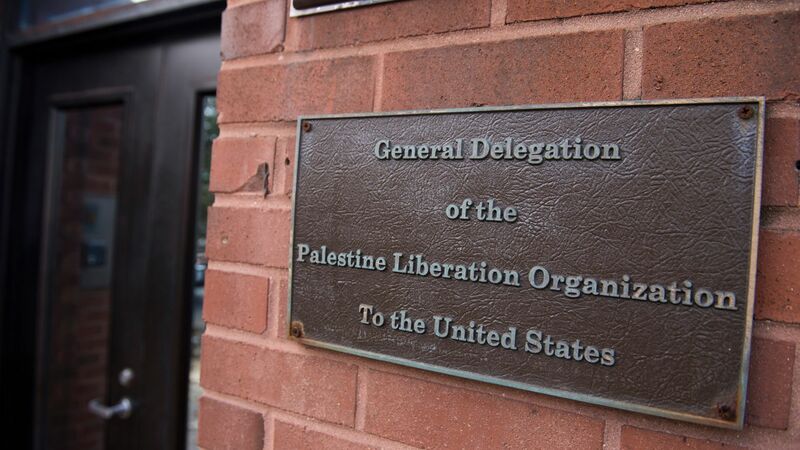 PLO offices in Washington DC have been ordered to close after they violated at 2015 law outlawing taking Israel to the International Criminal Court. The United States does not recognize the authority of the ICC. It does not allow the ICC to take US soldiers or officials to court. Despite the fact that the US has been the world protector and policemen, not to mention primary source of aid to so many countries, there would be a line around the corner seeking to prosecute US officials at the ICC, if the US was a signatory. Sadly, many of them would be fellow Americans.